August 12, 2013 by Venky. Time trial is that unforgiving discipline where the rider races against the clock and is considered the race of truth, because you don’t get to hide from the elements and there are no elaborate team strategies involved. It is you and your bike against the elements and the clock. But, cycling is inherently a team sport that involves elaborate strategies where the entire team protects its strongest rider, works for him and tries to put him in the best possible situation to win the race. So, when you take this race of truth from individual rider level to the team level and put the team to test against the clock, a lot more things get into the mix. Strategies come into play. What should the rider order be? For how long should each rider be working against the wind? Who should be at the front on the hills and who on the downhills? How should rider transition happen? From which side and how quickly should it happen? Should some riders be sacrificed or the entire team finish together? How best can the differences in rider skill and ability levels be utilized to the advantage of the team rather than against it? These and more questions need to be answered by the teams to figure out all the ways to beat the clock. Team Time Trial is the race of a team against the clock. For the first Team Time Trial at the Bangalore Amateur Racing, we stipulated that the teams can have a maximum of three riders and a minimum of 2 riders with the timing of the second rider being considered for the team’s time. That meant that any rider who is not part of any team just needs to find one ride partner to make a team of their own. This also allows for bigger teams to field more than one team if they want. More Teams On Their Way! 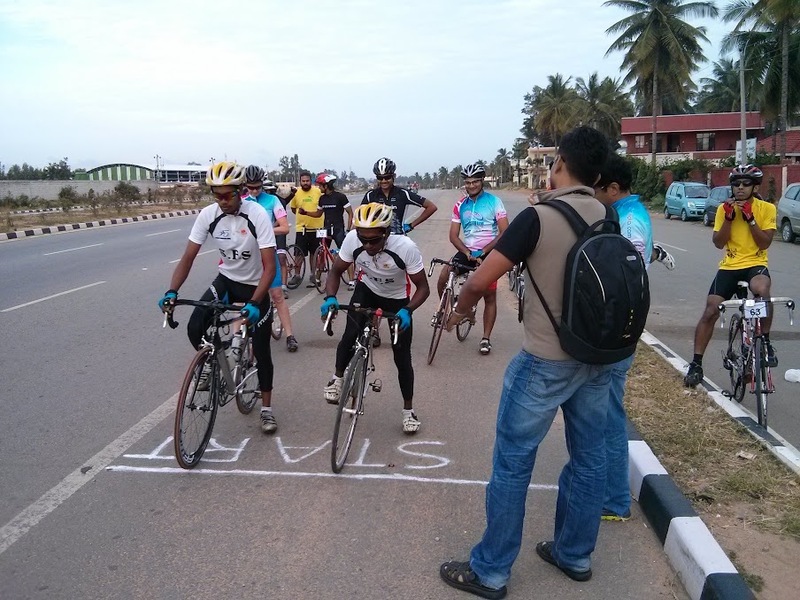 23 riders got together formed 9 teams and raced against the clock on Sunday. The race was kicked off 6mins later than the planned 7am start. Mohan Kumar, Gautam Raja and I, represented Spectrum Racing team1 started one minute behind Team BOTS consisting of, Craig Raynes and Somaskanda. We decided that Mohan a.k.a The Demon will lead the train followed by Gautam and then myself. That meant that I get a couple of minutes to hide behind my teammates and get my legs warmed up. We decided to use one minute turns. That means the rider at the front will work against the wind for one minute before getting back and let the second rider do his one minute turn at the front. The rider at the front working against the wind will be putting a big effort for that one minute and will be getting a two minute recovery while drafting behind his teammates before his turn at the front comes again. After the first ten minutes we began to see the orange jerseys of team BOTS at a distance in front of us. They became our carrots(their jerseys were of the right color too) and we began to drill it to try and close the gap. As we kept going and approached the U-turn point 16.7km into the race, the gap kept reducing until we overtook them around 20km mark. Team BOTS was essentially Craig, the old diesel engine pulling the youngster Somaskanda along almost all the way. He appeared to be quite relaxed and on his leisurely Sunday morning ride as we went past him. It took the three of us, 20km of huffing and puffing to basically catch Craig on his leisurely ride. That too he is just getting back on the bike after he tore his shoulder ligaments during a crash in an MTB race in Canada a month back. What an engine! After we went past them, for us it was all about dealing with the two inclines on the route the best way we can. Mohan was doing what he does best and pulling strongly and Gautam did a strong turn in the front on the last incline to round off a good team effort. We charged the downhill after that to the finish line with a strong effort. As we waited for the last teams to finish, the results were calculated and by the time the last team crossed the line, the results were ready to be announced. Spectrum team1 and team2 finished first and second respectively followed by team BOTS at third. Spectrum Racing presence for the TTT. Team1 and Team2 finished first and second respectively on the day! Good turnout at the event again and good smooth execution of organizing by Venkatachalam(DaLam) of Cleated Warriors and Hari Menon of Spectrum Racing. Thank you for the super job guys! More photos from the race from my camera are here, from Nalla’s camera are here. The next Bangalore Amateur Racing event will be the 3rd Individual Time Trial(ITT) in the series on 25th August. Please check the event details are here. With a lot of riders also into running, there were requests for conducting a duathlon if possible. So, we are going to try our hands with a small duathlon event on September 1st. Please look for more details here.